You can change the color of the brush that is used to show selected text in a TextBox by setting the SelectionBrush property. 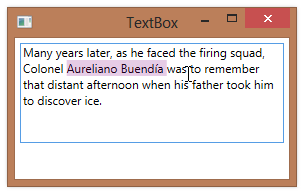 You’ll typically set this property in XAML to the name of the color that you want the text selection rendered in. This property defaults to a SolidColorBrush whose color is hex 3399FF (R=51, G=153, B=255), or light blue. The opacity used by the selection brush defaults to 0.4, but you can set it to be more (>0.4) or less (<0.4) opaque by changing the SelectionOpacity property. Hey Sean, This was really helpful, however can you let me know if its possible to change the ForeColor of the selected text? I don’t know of any way to change the foreground color of the selected text, no.